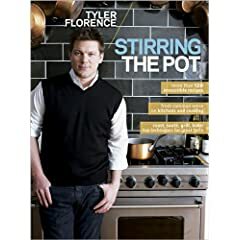 ... more great recipes by Tyler Florence on our GREAT CHEFS page! Avoid using a salad spinner to wash and dry the arugula-the leaves bruise easily. Instead, dunk them in a sink of cool water and lift them into a colander. Pat dry with a kitchen towel. Simple salt and pepper will form a crust on the steaks when you sear them. I don't normally serve anything else with this warm steak salad except the rest of the bottle of Cabernet used in the vinaigrette recipe. Start by preparing the peppers because they will take the longest. Preheat the broiler. Pull out their cores, then halve the peppers lengthwise, and remove the ribs and seeds. Toss the peppers with a little olive oil, salt, and pepper. Place them on a cookie sheet, skin side up, and broil for 10 minutes until really charred and blistered. Put the peppers into a bowl, cover with plastic wrap, and let steam for about 10 minutes to loosen the skins. In the meantime, move on to the steaks. Switch the oven from broil to bake and set the temperature to 350°F. Season both sides of the steaks with sea salt and a generous amount of coarsely ground black pepper, about 1 tablespoon of pepper per steak. Place a cast-iron (or regular ovenproof) skillet over medium-high heat. Coat the bottom of the pan with a 2-count drizzle of olive oil and get it smoking hot. Add the steaks and sear for 4 minutes on each side. Throw in the thyme, then transfer the skillet to the hot oven and roast the steaks for 5 minutes for a nice medium-rare (120 to 125°F. internal temperature). The last thing to make is a quick vinaigrette using the flavors left in the bottom of the skillet. Pour out some of the beef fat and return the pan to the stove. Add the red wine and boil over medium heat while scraping with a wooden spoon to pull the flavors up. Let the wine reduce to 1/4 cup; this will intensify the flavor. Add the sugar and a 1-count of olive oil to balance it out. Putting it all together is a snap. Cut the steaks on an angle into slices. Gently toss the peppers and olives with the arugula. Drizzle the salad with a little more olive oil, a squeeze of lemon juice, salt, and pepper. Toss lightly again and then divide between 2 plates. Arrange the steak slices on top of the salad and garnish with the crumbled blue cheese; then drizzle the pan vinaigrette over the steak salads and serve. * A peek into life at home with Tyler. He shares the dishes he likes to prepare for his family and friends when he's off the clock. * The table of contents is organized by occasion, such as his son's first birthday party, a romantic meal for two, Christmas dinner for the whole Florence family, and a simple meal for a rainy Sunday afternoon. 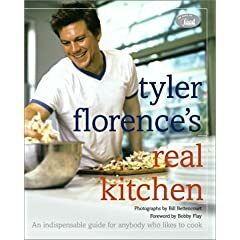 * Tyler's menus and recipes feature twists on comfort food classics and showcase his secret family recipes as well as his personal favorites. * Menus and personal photos from Tyler's home-cooked meals and dinner parties. * Beautiful food and lifestyle photos. * Opens with a hardworking front of book: “The Anatomy of a Knife,” “Pots and Pans You Can't Live Without,” “Good, Better, Best” (Tyler rates the latest gadgets and kitchen equipment). * Tyler shares how to navigate the aisles of a grocery store like a pro so readers can create the “Ultimate” pantry . * More than 100 must-master recipes. * Loaded with photos, including one of every recipe. 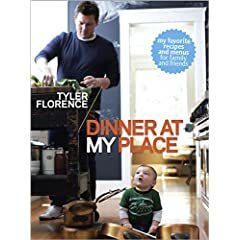 Florence brings a unique perspective to the table with his understanding of how Americans like to cook and eat today, having helped people across the country with their cooking challenges. Before becoming a celebrity chef on the Food Network, he was the executive chef at the award-winning restaurant Cafeteria in Manhattan. He trained at the College of Culinary Arts at Johnston & Wales University in South Carolina. He has been featured in Food & Wine, GQ, The Wall Street Journal, USA Weekend, and People, and created specially branded menu items for Applebee's restaurant chain, appearing in their television commercials. In what seems to be a bid to become a U.S. version of Naked Chef Jamie Oliver, Florence (who was chef at New York's Cafeteria and hosts his own cooking show) aims for a casual attitude. While organization is loose amorphous chapters on backyard cookouts and Dinner for Two sit side-by-side with highly focused ones on making your own sushi many of the recipes themselves are clever. Sage-Roasted Pork Tenderloin with Dried Plum Sauce features a tasty sauce made with red wine and prunes cooked until soft, and Roasted Sweet Potatoes with Miso, Orange, and Sesame would make a great snack as well as a tasty side dish. The author darts from one subject to the next and often combines flavors unexpectedly, as in Grilled Salmon with Watermelon and Black Olive Salad and Horseradish Burgers with Havarti and Tomato Remoulade. Sometimes Florence's claims that the best cooking is easy, casual and quick are belied by recipes such as the one for Blue Cheese SoufflE with Chamomile-Fig Compote that requires creation of a bEchamel sauce, not to mention the notoriously tricky soufflEs themselves. Florence's tone is light throughout, but readers may be turned off by airy pronouncements (It's often been my experience that many of the cleanest, best flavors are very simple ones) that under closer inspection are fairly meaningless. Others may roll their eyes at his off-color or immature remarks (a man of Thai ethnicity pulls out a karate move when asked to share a recipe; the flavors of a Green Curry Chicken are mental). Copyright 2003 Reed Business Information, Inc.